The one thing no one expects on a job interview is North Korean hackers picking up on the other line. But that’s apparently exactly what happened to a hapless employee at Redbanc, the company that handles Chile’s ATM network. The bizarre story was reported in trendTIC, a Chilean tech site. A Redbanc employee found a job opening on LinkedIn for a developer position. After setting up a Skype interview, the employee was then asked to install a program called ApplicationPDF.exe on their computer, trendTIC reports. The program was reportedly explained to be part of the recruitment process and generated a standard application form. But it was not an application form, it was malware. Because the malware was then installed on a company computer, the hackers reportedly received important info about the employee’s work computer, including username, hardware and OS, and proxy settings. With all that info, the hackers would then be able to later deliver a second-stage payload to the infected computer. 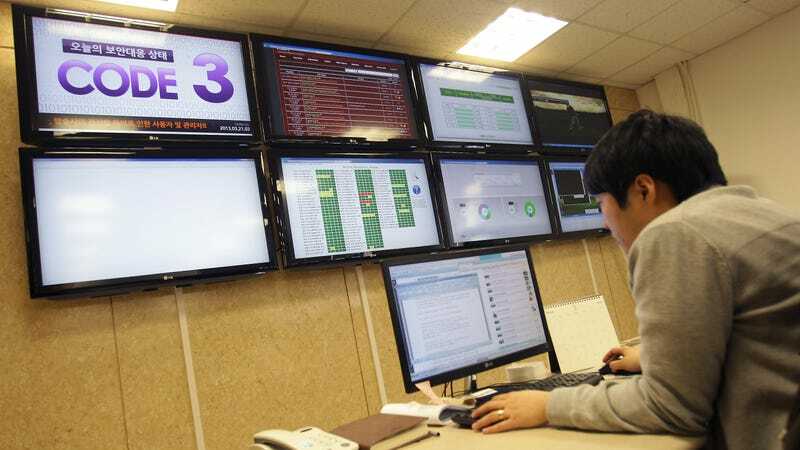 As for the link to North Korea, an analysis by security firm Flashpoint indicates the malware utilized PowerRatankba, a malicious toolkit associated with Lazarus Group, a hacking organization with ties to Pyongyang. If you haven’t heard of these guys, you’ve definitely heard of the stuff they’ve been up to. Also known as Hidden Cobra, the Lazarus Group is linked with the Sony hack in 2014 and the WannaCry 2.0 virus, which infected 230,000 computers in 150 countries in 2017. They’re also known for targeting major banking and financial institutions and have reportedly absconded with $571 million in cryptocurrency since January 2017. The hack reportedly took place at the end of December, but it was only made public after Chilean Senator Felipe Harboe took to Twitter last week to blast Redbanc for keeping the breach secret. Redbanc later acknowledged the breach occurred in a statement, but the company failed to mention any details. That said, there were some serious security 101 no-no’s committed by the Redbanc employee that we can all learn from. Mainly, it doesn’t matter how much you hate your current gig, you should be suspicious if a prospective employer asks you to download any program that asks for personal information. Also, for multiple common-sense reasons, maybe don’t do job interviews on your dedicated work computer. And while it’s hard these days not to take work home, for security reasons, you should definitely be more discerning about the programs you download onto a work-issued device. Sounds simple enough, but then again, it happened to this poor fellow. Consumer tech reporter by day, danger noodle by night. No, I'm not the K-Pop star.